A dream line-up, that's what it was. How many people wouldn't have given their right arms to be able to witness such an event: Top acts from both the death and black metal genres headlining with some impressive support bands thrown in for good measure. It was a good thing that I bought tickets at an early stage, since, as expected, the 1200-capacity venue was sold out. Peccatum, the side project of Emperor's Ihsahn together with wife Ihriel and her brother, faced the task of kicking off. After a lot of thought I've reached the conclusion that their musically complicated first album 'Strangling from within' is a bit too much over the top to be really listenable. Especially Ihriel's vocal performance is less than soothing, although she is supposed to be a classic singing teacher. Live, I'm afraid, it didn't work out at all. Even Ihsahn's admittedly excellent guitar playing couldn't turn the balance in their favour. Next up were black metal's computer wiz kids Limbonic Art. Although in general I prefer a real live drummer over a stack of electronics equipment, they seem to be virtually the only band in which drum computers actually work. Their live sound was unfortunately pretty bad, especially close to the stage. Further to the side you could at least recognise the songs. In spite of all this they managed to elicit response from the up till then pretty quiet audience. The Crown, previously known as Crown of Thorns, just released the sub-top death metal album 'Hell is here'. On stage they were said to have been not better than mediocre, although I wasn't present to witness things due to interviewing duties. 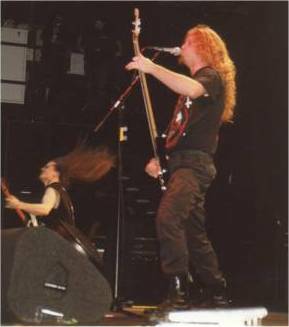 Impaled Nazarene were the last minute replacement of true American BM band Absu. Their show seems to have been a definite improvement over The Crown, being very brutal, but without much variation. I was still doing interviews unfortunately, so I only know what I heard. All traces of tiredness evaporated like snow in an H-bomb explosion with the arrival of black metal gods Emperor. Tonight they were in the best shape I've ever seen them in, with even the sound quality reaching perfection. Tighter than eehm... a very tight thing, they blasted through their show filled with tracks from all the albums, which received a lot of enthusiastic response from the audience. As if that wasn't enough, the evening was concluded by death metal veterans Morbid Angel. They have existed for almost 10 years longer than Emperor, which could be seen from the fact that the live experience almost dripped from their performance. This was definitely one of the tightest death metal sets ever. Unbelievable! The audience clearly felt the same way and the whole place went mad. Nothing else can be said, except the fact that the adrenaline kick took three days to wear off! This is the type of concerts that you can really thrive on!